"In 1937, I was an architect (read: labourer, baker, farmer). One among all those who had come from the four corners of the globe to work with Le Corbusier. Back then, the architect was a species of limited awareness of the wider world; no one among us had ever pronounced the word Surrealist, nor the name of André Breton. I met him without knowing it. At our first meeting, he asked me to illustrate one of the Chants de Maldoror; the name of Lautréamont had never been mentioned either. I opened my eyes so wide that I was practically blinded. "I went to see Breton who had begun to rock my very foundations. He invited me to his house on December 31st 1937, the evening of new year's celebrations, at nine o'clock. This would be a festive dinner, Surrealist, disquieting and luxurious, perhaps even worldly. My entry into the real Paris of modern poetry, the Paris of scandal. For I was then as many people still are today, someone for whom the word 'Surrealist' evoked only a universe of worldly insouciance, cynical and orgiastic: a revolution in taste. Nine-thirty in the evening, 42, rue Fontaine, a slightly run-down building-had I come to the wrong address? From the other side of the door there was not the noise typical of new year's parties. A dark landing, an encounter in the commonplace. I had prepared myself for hours and hours of soaking deep in a bath of delights. The door opened into a studio where there was almost no light. Breton and his wife were seated in front of a wood fire. Ten o'clock, no one arrived." 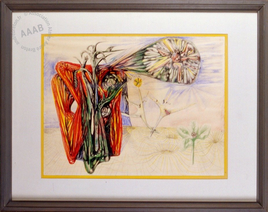 Matta, 1967 (in G. Ferrari, Entretiens morphologiques, Notebook n° 1, 1936-1944, Londres, Sistan Limited, 1987, pp. 52-53).